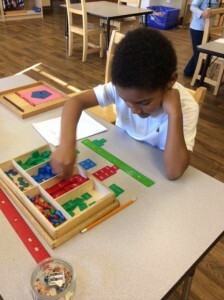 Montessori curriculum is supported through a series of concrete materials designed to help students conceptualize abstract ideas, particularly in math. Dr. Montessori believed that “the hands are instruments of the brain” and by using our hands in the learning process, we are better able to internalize information. Further, using a kinesthetic process aids in overall engagement and concentration. The Stamp Game is a Montessori material designed for learning and reinforcing knowledge of the four key math operations (addition, subtraction, multiplication and division) and it is an integral part of the mathematics progression. It is important to mention that math materials are progressive, and it can be difficult to speak of one Montessori material without referring to all those that have come before. Each material prepares for the next and builds on the concepts that have been mastered. The Stamp Game is first presented in Casa, after the child has learned place value (units, tens, hundreds, and thousands) with the Golden Beads. Prerequisites to using the stamp game are understanding the concepts of large and small numbers, simple exchanges of 10 units equaling one 10, and the child must know how to count using concrete materials (not necessarily with number symbols). The Stamp Game employs the hand and engages the mind to absorb concepts much more fully than working only with pencil, paper and worksheet, as is the norm. The child can use this material to understand all operations, making it something they can return to again and again. It prepares the child for pencil and paper work in a more holistic manner. The material consists of small wooden squares in common place value colours (green for units, blue for tens, red of hundreds and green for unit of thousands) that are used throughout the mathematics progression. The place value they represent, 1 (units), 10 (tens), 100 (hundreds) and 1000 (thousands) are written on them (1, 10, 100, 1000). Using this distinctive material, the child begins moving in the direction of abstraction where they will be able to complete an equation without use of the manipulatives, although this remains a far way off. Interested in learning more about our Mathematics program? Contact us!